Welcome to our review of Interbet. Interbet is one of the oldest sports betting brands, originally designed for bookmakers, it was opened up to punters and has now moved from horseracing to include multiple sports as well as soccer and rugby tote bets. They are also the only sports betting service in South Africa to offer a loyalty point feature which gives punters the chance to bet more. Interbet is a secure web trading system that allows clients to bet online with many of South Africa’s licensed bookmakers. They are the only legal horse racing and sport betting website where users can place a bet with nearly 100 of South Africa’s leading bookmakers. Their unique model allows only for permit holders to place bets, which means that the public must at all times place their bets with bookmakers. They offer consistent and competitive odds on horse racing and sports as well as dynamic and exciting interactive software which allows users to negotiate online for better odds. Their odds are usually 20-30% better than odds quoted by the industry. Interbet guarantees their clients with privacy and confidentiality by ensuring all bets are made anonymously. They are also the only website where users can bet on fixed odds or the tote bets while using only one account. They welcome small and large players and provide customer support 7 days a week as well as the best audio and visual tutorials to help new players get started. InterBet International (Pty) Ltd formed the concept for the betting website in 1998 and began creating their business plan in 1999. They began their software design and development in 2000 and launched their bookmaker-to-bookmaker trading system in July 2001. Within months, a large range of bookmakers were making use of the system and Interbet invited the public to bet on a sport only website, called Legendsbet, in July 2006. 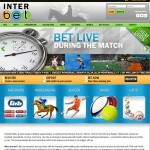 After much local and international demand, Interbet has decided to add horse racing to their offering. They offer real time market information which provides punters and bookmakers with the correct knowledge that they need to make the best decisions. Punters can rest assured that they will always be able to access the best odds, while bookmakers can have confidence in laying large bets. All bets are confirmed instantly via the internet ensuring an extremely fast response time. They offer betting on horse racing from South Africa, Zimbabwe, Mauritius, Dubai and the United Kingdom as well as all major South African and international sporting events. Telephone betting is offered, however, Interbet implores customers only to use this service in exceptional circumstances when they cannot access the online or mobile betting site. The service is only available during office hours and does not guarantee total satisfaction. The minimum stake for bets placed over the telephone is R100. They have a mobile-friendly website which can be accessed using any phone with an internet browser. Users can place bets from anywhere at anytime using the mobile service. Registration is fast and their website is easy to use. Clients can also follow Interbet on their Facebook account where they can view the latest racing news and tips. Interbet only accepts transactions in South African Rand(ZAR). Deposits can be made using electronic fund transfers(EFT), send a cheque, bank deposits and credit cards. They accept Visa and Master Card credit cards and have a bank account with Nedbank. Their credit card transactions are secured by Visa and Mastercard Securecode.